Nine hundred and ninety-nine days ago, or nine hundred and ninety days ago, or nine hundred days ago, I don’t think I could have imagined surviving to one thousand. It sounds like such a long time. So many days, so many nights. So many tears. Such a piercing pain. But I have survived. Am I “over it?” Never! But the fierce pain isn’t there all the time any more. It still comes back. I can be back in that ICU room in an instant. But sometimes I can be happy, and mean it. My Mark has been a rock. I’ve cried so many tears on his shoulders. My Annie has been my co-traveler in grief. 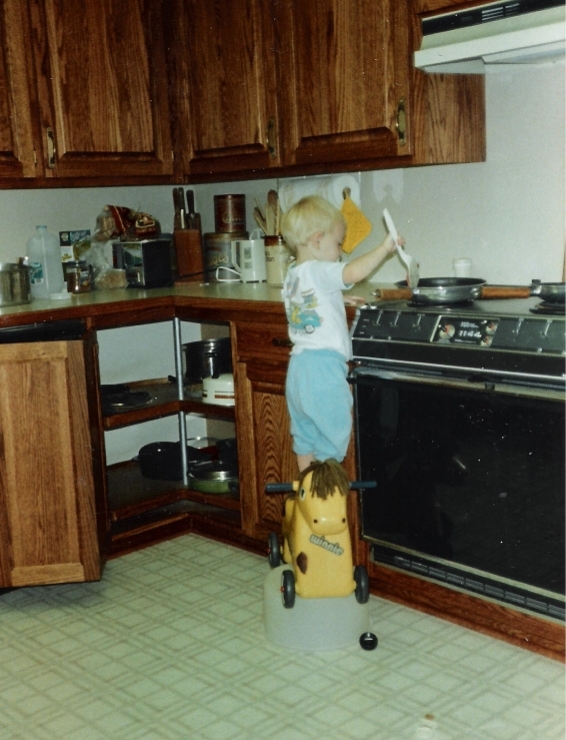 When David was a little tiny guy, he wanted to be a chef! 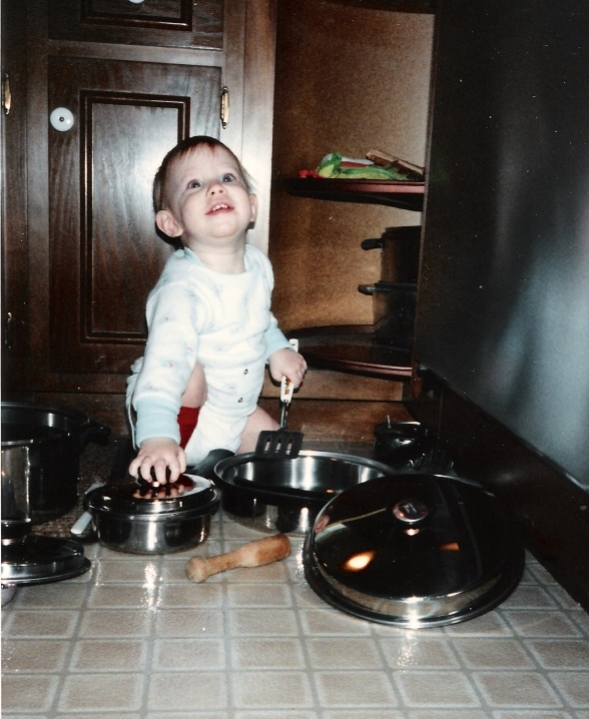 Like almost all toddlers, he liked playing with pots and pans. He also wanted to cook! When he was four years old, I think, he was a chef for Halloween. Easiest costume ever! I made a huge chef hat from a white posterboard for the band, and a big circle of shiny white wrapping paper gathered and taped to the band to make a big pouf on top. I got white sweats, and safety-pinned wooden spoons, whisks, plastic spatulas, etc. all over him! Fun! 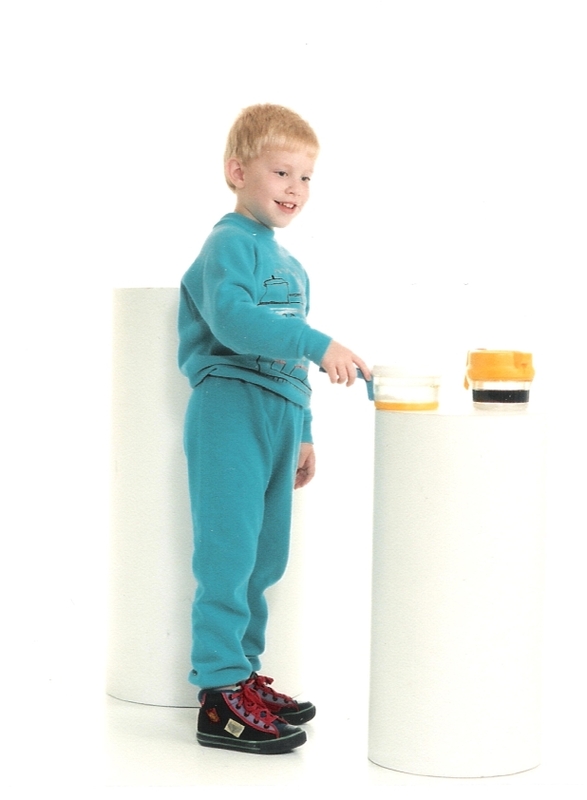 And, as for almost all kids, big cardboard boxes were an endless source of entertainment. For a while, every box had to be made into a stove! He would draw burners and knobs and dials on top, and an oven door on the front. In the oven, on every box, was a birthday cake! And on every cake was a flaming candle, with smoke rising from it! So cute! I looked for a photo of one of his stove-boxes. I couldn’t find one; I don’t know if there are any. And then, I remembered! I still have that shirt! Thank you, Mom, for saving it for me! 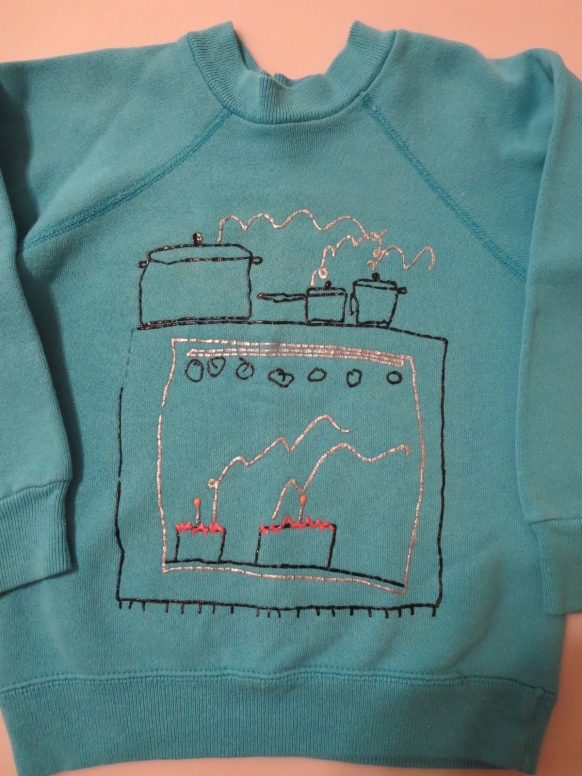 Drawing stoves eventually went by the wayside, as did playing chef. But David still liked to cook. He stayed with us for several months the summer before he died, and he helped me make dinner almost every day. He grilled, he chopped veggies for salads. We got some Hatch green chiles, and made green chile salsa. 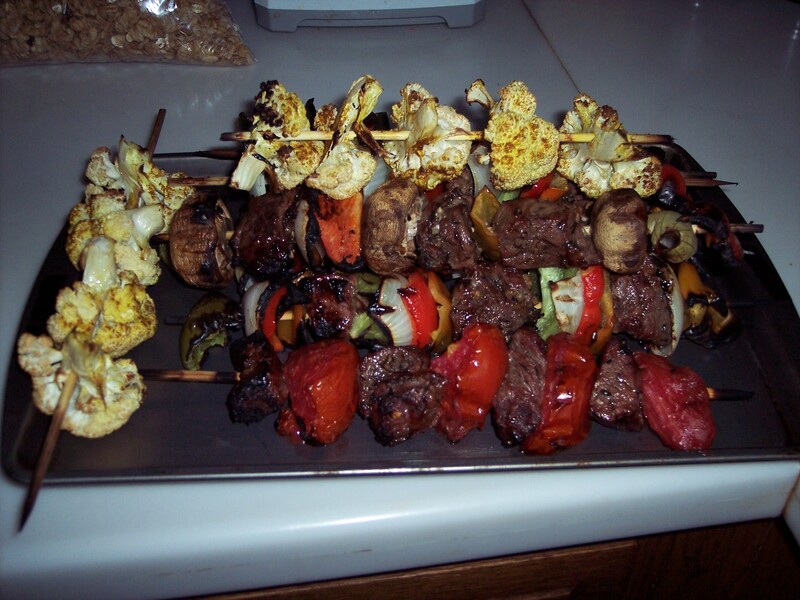 One day we made kebabs, and he was so proud of them that I took a photo. The last birthday photo I have of him is from five years ago, on his twenty-fourth birthday. Happy Birthday, David! I’ll love you forever! My heart breaks for you today. I cried as I read, and especially when I saw his picture. Sending hugs and prayers today. Don’t know what to say. I feel so much empathy for you but I don’t know how to express it. He must have been a wonderful boy and the best thing is that he was loved and is loved unconditionally by his family. God bless and keep you. Thank you, Myrna – he was a sweetie! I feel your pain! It’s one that never goes away. Happy Birthday David! May God be with you and your family today and all days. I’m glad you’re more than surviving. It’s tough. Your tribute is beautiful. For us it’s been almost 16 years, yet I still tear up as I empathize with you and the dailyness of your grief. I can only echo Debra’s words. I can not imagine the pain of the loss of a child. Thank you for sharing, It couldn’t have been easy. Thanks, Cozette. I wrote this several days ago, and wasn’t sure I would post it, but am glad I did. Sue, God bless you, Annie, Mark and your Mom. My heart goes out to you for all the pain you’ve endured but thank you for sharing this loving, lovely tribute to your little “chef.” My eyes filled with tears reading this and I’m so glad you wrote it. Sending love and hugs. Thank you, Kimberly! Hugs to you! There will always be a place in your heart for him so he lives on in the memories. You have survived 1,000 days. So deeply sorry for your loss. Praying for you and your family. Thank you for writing, Alicia. I hope you are doing well. Thinking of you today. So sorry for the loss of your precious boy. So glad that you can remember happy memories and special times. Hugs and prayers coming to you from me. Hugs! So sorry for your loss of David. He was a sweet person. Thank you, Debbie. I hope you’re doing well. What lovely memories of your wonderful son. What did he decide to do, then? Keep the good times close to you. <3. Thinking of you today, Susan. I understand every word and every feeling you are having. 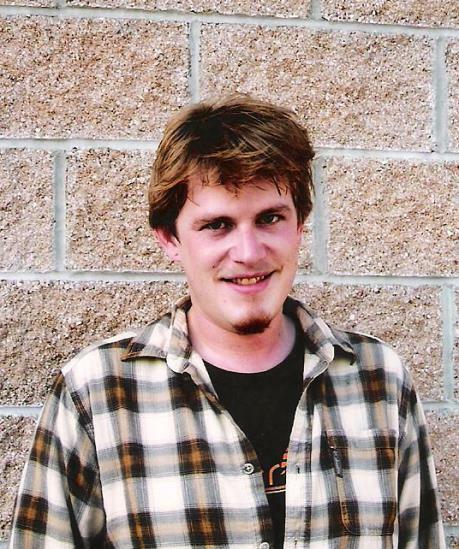 During the Husqvarna convention in 1999 I left your heart runner class and learned that my son had passed away in Seattle, he was 29. I still have the unfinished project from that class, I think I will get it out and finish it. Thank you, Linda. You wrote to me earlier. Finish the project in his honor and send me a photo. Thinking of you and your family today. Susan, so many of us understand and empathize with your pain, because we’ve been through it. One of the things you feel is that you’d give anything if another person didn’t ever have to endure it. But, as much as we wish, we can’t make it not happen. I loved reading David’s story. It’s a club on one wants to belong to. Thank you. Thank you for sharing your heart. My heart goes out to you.